Baath cake recipe with step by step photos. 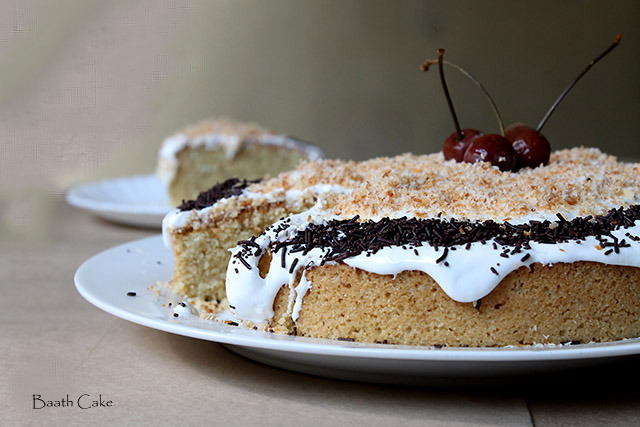 Baath or baathika cake is a traditional Goan Delicacy made of Semolina and Coconut! I am happy to post Baath Cake Recipe which is a Christmas and Easter dessert specialty. Also, I made this cake on Venessa’s request so Venessa I am updating this recipe especially for you and all my readers. The cake turned out to be delicious, dense and yummy cake. My family loved it. I am sure Venessa, this time, you make this cake. It will turn out the way you want to. This cake is mainly made of semolina, dry coconut flakes or fresh grated coconut which gives an exotic flavor to this cake. It’s a must try do try this recipe… I am sure all of you would love them! I am going to meet up my friends so thought of making Baath Cake. I can carry them along with me and give to all my friends these goodies. Even my pet loved them. Baath Cake gives a nice yellow color and brown on top. Also, there is no need to frost this cake. As this tastes the best by itself also looks best by itself. However, I have modified the recipe and given a twist to the baath cake by keeping cake traditional but with frosting. The baath cake with frosting looked appealing and tasted much better. I really enjoyed the Baath Cake and is one of my best cakes till date. I keep making baath cake quite often as hubby loves them. Also, I have tried making both cake with desiccated coconut as well as fresh grated coconut both taste the great slightly different flavor. However fresh coconut cake should be eaten quickly as it won’t be edible after 3 days. You could try dry coconut as that will stay longer. In this recipe, I have used grated fresh coconut. You can also check out eggless baath cake version! by clicking here. If you are looking for more goan recipes then do check goan fry prawns, goan shark fry, goan pomfret recheado, raw banana fry, dry shrimp curry with raw mango, mandeli curry, mandeli fry, dry clams, shark fry, fish ambotik curry, fresh bombay duck curry and crab curry. 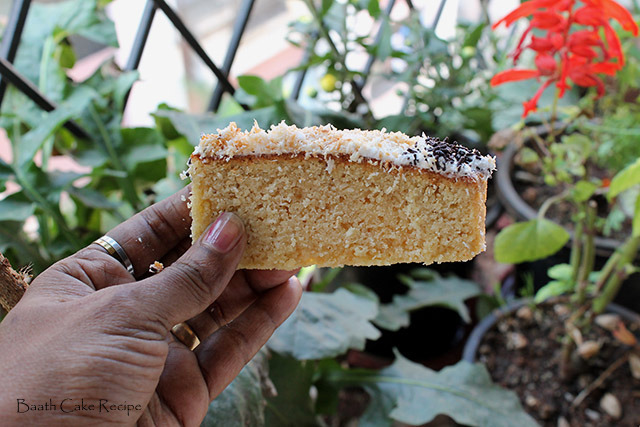 Baath cake a traditional Goan Delicacy made of Semolina and Coconut! Baath Cake gives a nice yellow color and brown on top. Take a greased round pan or any shape you desire. Grease them generously and dust some flour on it. Preheat the oven to 180°C exactly fifteen mins before baking. Grind the fresh grated coconut with rose water or vanilla essence to a fine paste. If using desiccated coconut flakes grind them with rose water or vanilla essence. Keep it aside. Beat eggs till fluffy and changes color till pale yellow for about 6 mins on high speed. Cream ghee/ butter/ coconut oil and sugar separately and add to the beaten egg mixture until it looks creamy. Fold in semolina gently into batches of three. Now fold in the grounded coconut paste, baking powder, corn flour and salt. Cover with a lid or foil and allow to ferment overnight. Now keep the above mixture for about 5 hours or overnight for best results. Since Mumbai is humid and hot. It's advisable you cover and keep this cake batter in the fridge. Before baking them remove an hour earlier to make it at room temperature. Check the batter in the morning add milk if it's appearing dry and mix nicely. Finally, add Vanilla Essence. Bake at 180°C for about 40 mins or until the skewer comes out clean. The cake should be firm on top when touched and appear golden color. Allow the cake cool down completely and then unmold the cake gently.Your Baath Cake is ready. Serve hot or chilled. Slice them and store them in an air tight box. Frosting is optional but it does create a visual impact to your cake. Beat whipped cream with sugar allow to chill for 30 minutes. Spread cream-sugar mixture all over the cake. Spread desiccated coconut flakes on a baking dish / tray. Bake at 200°C for 8 to 10 mins. Keep stirring in between else they might get burnt. 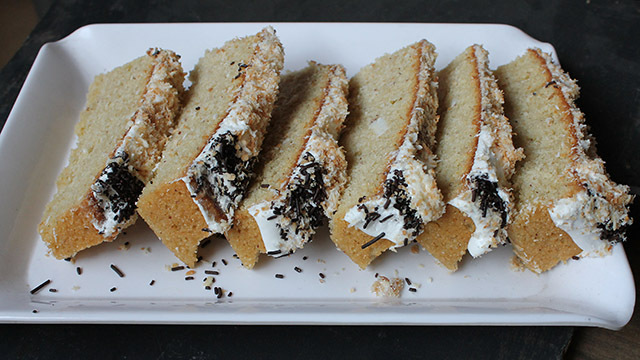 Now sprinkle the toasted coconut flakes all over the cake. 1. Please don't overbake nor underbake this cake. this post is worth reading, thank you for sharing. When do we have to add the corn flour? Can’t find it mentioned in the method. Can you give the recipe in cups instead of grams …. it will be easier for me since I live outside India . Annie thanks for positive views. Surely will help you. 350 grams = 2.5 cups, 1.5 cups butter, 1.8 to 2 cups of sugar. Hope this information helps you. Let us know how the cake turned out? I prefer less sugar but you can increase the sugar level. Thanks for your prompt reply. Will definitely try it and let you know. Sure Annie let us know, thanks. I just love Bhaat cake and have been looking for th recipe since . I live in the US and it is hard for me to get a ingredients in grams . Can u let m know the qty in cups instead. That will great help . Goodness me. Just buy a $10 scale. Problem fixed. Soooooooooo….simple! Manju you can us baking soda instead of baking powder. Excellent recipe.I used fresh coconut,Amul butter,no salt, 1tsp baking powder,and rose water.Kept it in humid climate for 4 hours only. Excellent presentation Maria, the options offered freedom to experiment..God bless you. I am looking for an authentic guava cheese recipe which will really be cheesy to the bite,but not soft,and definitely not hard.Could you help please? Thanks Sabina, glad you liked the baath cake. Apologies for the delay in reply. Yes check this link for guavacheese recipe here. 1. Just see is the desiccated coconut is not spoiled. if they are lumpy you could roast them for 1-2 min on a low heat in a wide bottomed pan. 2. Yes the consistency looks like suji halwa. 3. Adding milk won’t spoil the batter but on a safer side place them in the fridge over-night. 4. For half the recipe add 2 big eggs. Hope this helps you and do let us know how the cake turned out ? and you are welcome. pleased to know this sarita thankyou for your kind and positive words 🙂 surely keep trying more recipes and let us know how they were. you are welcome. Just to let you know that all Americans like this cake and I had taken it to Nashville and they just took 2 pieces instead of 1. Thankyou Irene 🙂 also there was a typo error so corrected to 1. Do I have to bake at 180c for 40 minutes or 100c for 40 minutes? Is it also ok if iI skip cornflour? Monisha thankyou for pointing out it was a typo error. Please bake the cake at 180°C for 40-45 mins or until the skewer comes out clean. Yes you could skip cornflour hope this helps you. Can you please help me in getting the recipe of Ode Goan style (the crispy round ones) without sugar. This particular sweets will make a big difference with other sweets of chocolate, sugar, cream etc. Could you please throw more light as what Ode you referring to?? will check with my mom and relatives. Thankyou for coming here.. It is Christmas time & I thought of finding some recipes. I am very happy to find your site. You’ve done a splendid job of simplifying the whole process, each time. Even making rushed people like me to try making some of these!…am definitely going to. Most of all I like you’ve been so generous with your recipes. I like the clean organized manner of presenting them. It shows you love to cook & very keen in whatever you do. Am sure your family is very blessed to have you. I appreciate the openness & sincerity & not forgetting your sense of humor ..keep working hard..your dedication will surely pay off. Of-course you really can be a millionaire some day!! I just stumbled onto your blog yesterday and decided to try this recipe out. It tastes yummy. So I got inspired and tried out your Indian mutton curry recipe as well since I was planning to cook mutton for dinner anyway. My husband and 2.5 year old daughter loved it. I will be returning frequently to your blog. Thanks for taking the time to share. God bless you! Thanks Jolly you made my day with your lovely comments 🙂 🙂 have fun while cooking god bless you and your family too ! Charmaine thanks for coming here give me some time will surely update you take care! Please reply i want to make it tmrw. Thanks Vrinda (Violet) cornflour helps the cake to rise better. Also fresh coconut gets spoiled too quickly it will be better if you try with desiccated coconut. Hope this helps you keep me posted how your cake was? tried out your super receipe which is a very sincere and honest one giving the ingredients in the right proportion which turned out to be my first sucessful receipe at the very first time itself . very rarely do people post the correct proportion which you have done . thanks . ……….i was just wondering what would become of the baath receipe if i experimented with 1 and 1/2 tsp pf baking powder instead of 2 tsp since my stomach does not take too well with baking powder is there any other substitute ??? can lime be used instead ? Am so delighted to see this recipe… The pics look totally yummy…. Cant wait to try this recipe…. Will definitely keep you posted. Thanx a ton!!! !